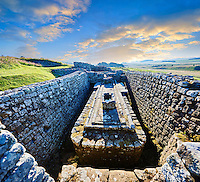 Pictures, photos & images of Housesteads Roman Fort and Hadrian’s Wall, England. 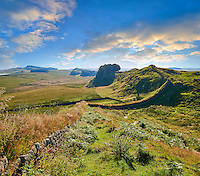 Hadrian’s Wall, in latin Vallum Aelium, runs across west to east some of England's most dramatic countryside. Built by the Romans in 122AD from the North Sea, along the banks of the Tyne then west to the Solway Firth of the the Irish Sea a distance of 117.5 km (73.0 miles) , it was completed in 6 years. It was ordered to be constructed by Emperor Hadrian who realised that the Roman Empire had grown big enough and needed protective walls around its boundaries. 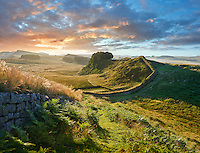 It is unclear if Hadrian’s wall was a defensive wall or if it was a way of collecting taxes from goods moving from present day Scotland south into England. Either way the wall represents an incredible engineering feat. On the north side of the wall is a ditch above which is built the wall 5 to 6 metres (16 to 20 feet) high and 3 metres (9.8 feet) wide which was wide enough to act as a military way. Every mile is a milecastle with two turrets which was permanently garrisoned. Every five miles is a fort which housed infantry and cavalry, the number of forts was between 14 to 17 in total. Housesteads, in Latin Vercovicium, is a fort situated roughly in the middle of Hadrian’s Wall built in about 124AD. Its ruins show the remains of buildings that would have house a large fighting force. The outline of granaries can be seen with the brick pillars that raised to floors to allow for underfloor heating. 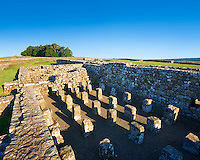 Housesteads Fort has one of best preserved latrines of Roman Britain. The fort was garrisoned by a double sized auxiliary cohort and legionnaires from the Legio II Augusta. The wall remained garrisoned until 409AD when the Romans withdrew and left England. 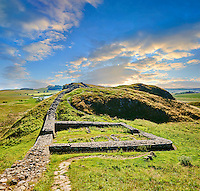 Hadrian’s Wall is a UNESCO World Heritage site because of it is a striking example of the organisation of a military zone and illustrates the defensive techniques and geopolitical strategies of ancient Rome. Housesteads is situated along the most dramatic section of Hadrian’s Wall where it is built along the bluff line of steeply undulating Hills. From this section of the wall the dramatic scenery of Northumberland runs in every direction. 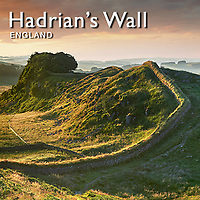 Buy high resolution Prints and Royalty Free on line downloads images of Hadrian's Wall England.